FRAME & SIZE: These computer reading glasses have permanently attached screws and measure 5 1/2" across , lens height 1 1/4” , temple length 5 5/16". AUTHENTICITY: FLORIDA GLASSES® products are accompanied by a branded microfiber dust cloth and a case. Whether you’re using a computer, tablet or enjoying a book, FLORIDA GLASSES® helps you avoid eye strain caused by harmful blue light and regain clarity. These computer reading glasses are suitable for men or women. Quality stainless steel frame, which qualities include: super light weight; nickel-free and thus hypoallergenic, excellent resistance to corrosion, abrasion and heat. These glasses also feature aspheric lens. Advanced optical design technology allows aspheric lenses to be made with flatter curves than conventional lenses, giving them a slimmer, more attractive profile. These glasses have permanently attached screws and measure 5 1/2" across , lens height 1 1/4” , temple length 5 5/16". Temples are very flexible, so they fit practically any face size. We guarantee 100% satisfaction on our rimless glasses. These computer reading glasses protect from CVS (COMPUTER VISION SYNDROME) by filtering high energy light waves and decreasing reflective glare and also improves visual sharpness. The symptoms are: blurred vision, headache, burning and tired eyes, neck and shoulder pain, etc. These computer glasses feature an anti-reflective coating lenses and are tinted for filtering the harmful light waves. 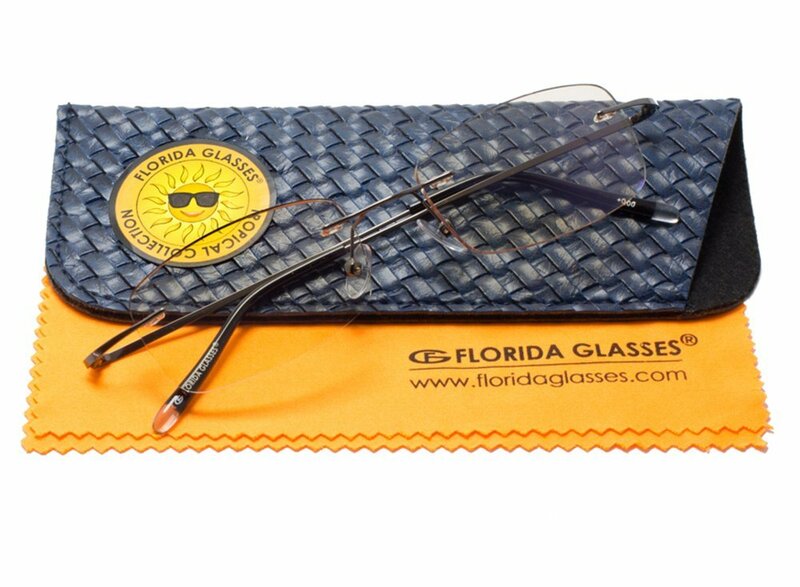 FLORIDA GLASSES® products are accompanied by a branded microfiber dust cloth bag. Click the button below to add the Rimless Computer Reading Glasses Tinted Lens Blocks Blue Light UV to your wish list.